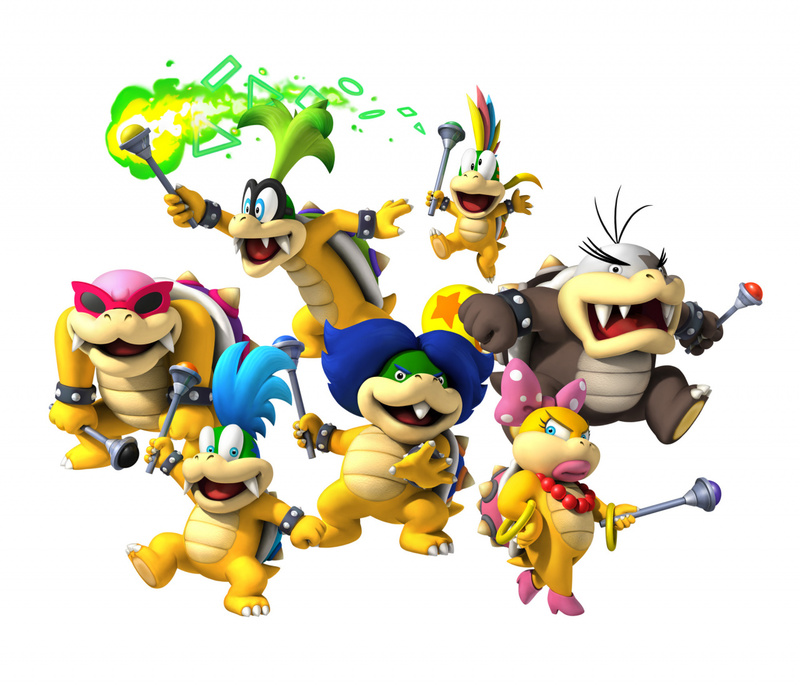 The Koopalings are a colorful and varied cast of characters that add a nice layer of personality to the Super Mario series. The seven characters are all wacky in their own way and, oddly enough, they technically aren't Bowser's children. Nonetheless, they have nothing but mischief on their minds and they offer up some pretty unique boss fights throughout the various games they appear in. Music has always been a big part of my life. I've been a DJ for years and have been a music collector for even longer. When I first saw the group of seven Koopalings, music was on my mind. The hairstyle on one of them reminded me of Ludwig von Beethoven for some reason and Ludwig von Koopa was born. Next was the one with the glasses—that has to be Roy Koopa in homage to Roy Orbison, who almost always wore glasses. Then Wendy O. Koopa (Wendy O. Williams) [and] Iggy Koopa (Iggy Pop). One looked like a loudmouth, so he was Morton Koopa Jr. from [the] loud-mouthed talk show host Morton Downey Jr. And then there was Larry. There's no real-world equivalent—he's not Larry Mullen Jr. from U2 or Larry King—he just looked like a Larry. That brings us to Lemmy. In addition to being a great name, it's perfect for a video game character. This Koopaling struck me as being the kind of character who would do his own thing, no matter what anyone else thought. I think it was those crazy eyes. Lemmy Koopa was in the crew. What do you think? Which Koopaling is your favorite? Do you think the names fit? Drop us a comment in the section below. "That brings us to Lemmy. This Koopaling struck me as being the kind of character who would do his own thing, no matter what anyone else thought." Just like the heavy metal legend he was named after. Rest In Power, Lemmy Kilmister. Larry does look like a Larry! He's my favorite Koopaling, followed by Lemmy. I always thought that Lemmy was named after Lemmy Kilmister. Ludwig and Iggy I kinda infered, but never new about the other ones. Iggy and Larry were my faves. Not to say that in Germany the Koopalings "technically" are Bowser's children... again! @DiscoGentleman It is, unless that bit about Larry being named after no one is true, and we've all been wrong for years. Another Mystery? This "mystery" was solved years ago. 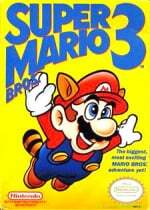 In my mind the Super Mario Bros 3 cartoon trumps as being more memorable than what Nintendo says today. A cartoon with a story and characterisation stands out more than the games which feature neither. @ikki5 For all the Koopalings? I've heard about Ludwig, but never any of the others. When did this guy talk about it before? "...he just looked like a Larry." This is kinda old news but still cool. I knew the references, just not the dude that made their names a thing. I don't know but I have heard that lots of times in the past. Might be that it wasn't officially stated but rather common sense and logic people used. @GoldenGamer88 @sWiTcHeRoO Those avatars confused me initially. So, who had it first? Very creative for a localiser! I believe it was stated somewhere else that Lemmy was named after the lead singer of Motorhead. Only bit of this that's really news is the Larry thing but still, good to know. Isn't the Reznor boss based off of Trent Reznor as well? By the way, let's not forget the reason why this came out recently. Rest In Peace Lemmy Kilmister, condolences to his family. I went to a friends wedding recently and the Reverand's name was actually Wendy Kooper. I found her quite hard to take seriously. @MitchVogel Don't know, I uploaded this pic as my avatar like seven, maybe eight hours after the Smash Bros. presentation (as I was asleep when it aired). But it's not the exact frame I cut out so I guess @sWiTcHeRoO and I just happen to really like Bayonetta's poster! @Mister_Wu Do you know what they say in the English version of Paper Jam in that shot? @scamander "Forgive us Bowser... I mean, Master Bowser", which is similar to what is said in the Russian version. The French version, on the other hand is a direct translation of the Japanese version, so it says "Ma.. Master Bowser", I'm still waiting for the Italian version and the Spanish version, because it seems that the European translators worked this time on a slightly different script than the Japanese one, as other cases of lines absent in the Japanese version but present in the European versions were found. Case in point, while in the first battle with Ludwig and Larry in the Japanese version Larry doesn't call Ludwig "brother", in the German version he calls him "bigger brother" (and all the other Euroepan version say "brother" or even "little brother" in the French one! ), so the German version actually conforms to the original depiction of the Koopalings! @MitchVogel Really? These have been on the Wikis for a long time and pretty well known among most Koopaling fans. The only thing different is the Larry thing. If they came out this year, Wendy would be named Iggy for Iggy Azalea. Similarities are uncanny. Larry! Larry is the best! This is awesome. I love that they're named after musicians. Interesting that Larry and Lemmy weren't actually named after anyone. Everyone always made assumptions about them. The Koopalings were always confusing since the Japanese version didn't give them names or even any explanation about who they were. So You had the Super Mario Bros. 3 cartoon coming up with their own names for them and claiming they were King Koopa's kids since they started working on the episodes before the game was released in the U.S.
Ha! That's awesome. I'd be the same way. Everyone would be like "what is he snickering about?". Lemmy was always my favorite. I still call them by their cartoon names. I also still have the smb3 manual and it says they are his kids. Other people can retcon them if they like, I'm not gonna. Looks like I'll need to blast some Motorhead and do a few rounds of MK8 in tribute. Oh my days. Get with the programme guys! I genuinely can't believe that the people who compile this site didn't know this. This "news" is literally ancient! Two more things. The fact Wendy O'Koopa is named after Wendy O.Williams of The Plasmatics is way cool. Second, R.I.P Lemmy Kilminster. An icon. You are one of the last of a dying breed. Thanks for the memories! @itzdanburton Even if it is SMW I wonder if Reznor was named after Trent Reznor too. That'd be so awesome if so. There seems to be quite a few musical references in Ninty games, my favourite recent example being that trainer in Pokemon X/Y who says his Pokemon's name is Sepultura. Brazilian metal for the win! @Tempestryke Well, the Japanese SMB3 manual says that too and the most ironic fact is that in the just released VC version of SMA4 the scans of the original Japanese manual were released as well and in them the original story that says that the Koopalings are Bowser's children, too! I bet you were stoked! I mean how cool is that? I know this is off-topic, but Twilight Princess HD bundle with Wolf Link amiibo is back at Amazon US, and ships to Canada (I tested using my old Canadian forwarder address). @ToneDeath Yep! I figure that's what caused this to resurface. He will be missed. I assumed Roy was named first because of those glasses and the fact Roy Orbison died a couple of on the after the Japanese release during the localization period. @Mister_Wu Thanks for the link and for clearing that up for me. Dayvv Brooks is a total legend. Trent Reznor is a gamer of old so I wonder if he's aware of it? @Mister_Wu are you sure it's the same guy? It could just be someone who has a username named after him. @HyperTurtle Lemmy was indeed named after Lemmy Kilmister, who passed away a few days ago. This interview arose specifically in correlation with his passing. @the101 If you watch his talk page on the Wiki you will see that he sent proof that it was him. I hope someone will ask for clarifications about that Larry Koopa story. We've known this information for years...?